Brachycephalic obstructive airway syndrome (BOAS) is an umbrella term for a number of anatomical abnormalities seen in dogs, who have a shortened skull and nose (such as pugs, French bulldogs, English bulldogs etc). Whilst the bones which make up the skull and jaw are shorter in these dogs, the tissues which fill the skull are often not shorter and therefore need to be compressed in to a smaller space. This makes getting air to flow through the upper airways (nose and back of the throat) and in to the windpipe much harder as there is more tissue to get in the way. We separate the soft tissue abnormalities we see in to PRIMARY meaning the ones which your dog develops as a young dog and are the initial cause of the breathing problems we see and SECONDARY which are the ones which occur secondary to the chronic increase in breathing effort needed to force air to flow past the soft tissues. The narrowing of the nostrils; overly long and thick soft palate; excessive amounts of tissue at the back of the throat (pharynx); an excessive amount of tissue packed in to the nasal cavity; a very narrow windpipe. The generation of significant breathing effort over a period of time can cause changes to the larynx (entrance to the windpipe). This structure is made of cartilage and with time, these cartilages can lose some of their strength and rigidity. This is an irreversible change which leads to the cartilages becoming floppy and makes it harder for the larynx to be opened wider when more air is needed in the lungs (such as when your dog is exercising). This can lead to severe breathing difficulties. The first stage of laryngeal collapse is when the laryngeal saccules (little pockets of tissues which sit just in front of the larynx) have everted (are pulled inside out when a dog has to breathe hard to get air in to the airways). Dogs with BOAS can often also have issues with vomiting or regurgitation which may or may not be associated with feeding or excitement. This can either be due to the significant effort these breeds require for breathing or can be associated with other conditions which are common in these breeds such as a hiatal hernia. Why is this important for you and your pet? Dogs with significant BOAS have more difficulty breathing, may have difficulty exercising and/or sleeping and ultimately may develop life-threatening breathing problems. These problems tend to worsen as they get older as secondary problems develop or if they put on weight. As laryngeal collapse is an irreversible change it is preferable to slow down or prevent the progression of this collapse. 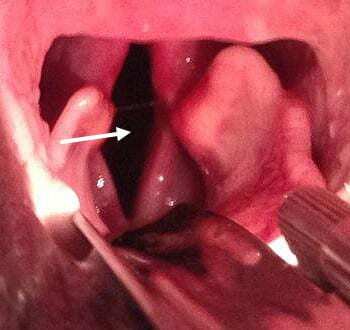 Earlier correction of primary abnormalities can slow or prevent the progression of secondary laryngeal collapse, thereby improving or stabilising the breathing difficulties depending on their severity. This should reduce the risks of life-threatening problems for most dogs and avoid the need for further airway surgery. But in addition to this…. The risk of problems on induction and recovery from anaesthesia is increased in breeds with BOAS. In particular, the risk of developing severe swelling around the larynx on recovery, or regurgitation and aspiration of stomach contents in to the lungs causing a severe chest infection, are two potential complications that we worry about. Although we regularly deal with such patients and are very experienced at caring for them, such complications can on occasion be life-threatening. Surgical correction of some of the primary abnormalities is often used to help reduce the chance of these complications occurring (although cannot take the risk away entirely). A normal larynx. Note the wide opening to the windpipe (white arrow) allowing the free flow of air. Abnormal larynx in a dog with BOAS with significant laryngeal collapse. Note the narrowed opening to the windpipe (white arrow) and the everted laryngeal saccules. How is the decision made as to whether surgery is appropriate for my pet or not? One of our soft tissue surgeons will assess your dog’s airway at the time of anaesthesia should you wish to proceed. The number of abnormalities present will then be assessed. Airway surgery is then performed under the same period of anaesthesia as your dog’s other procedures e.g. eye surgery etc. As discussed previously, the main risks of anaesthesia in these patients are the development of severe swelling around the entrance to the windpipe and the development of a serious chest infection after regurgitation of stomach contents on recovery from anaesthesia. We would anticipate that correction of some of your dog’s BOAS abnormalities would help reduce the risk of such problems occurring. Other potential risks of BOAS surgery include small risks of bleeding, infection and wound breakdown. If you are worried that your dog is showing the signs of BOAS, you should discuss this with your vet, who can arrange referral to the Soft Tissue Surgery service at Davies Veterinary Specialists for further evaluation.